The 10 Best Apple Picking Spots in Kansas! It’s apple picking time in Kansas! What could be better? The Sunflower State boasts some of the most sprawling and high-quality orchards to fill up your basket. You can pick apples in solitude or head out with family and friends to make the whole experience a big event. The fall in Kansas produces a superb variety of apples—juicy, sweet and delicious, you pick! Here are our favorite orchards in the state. 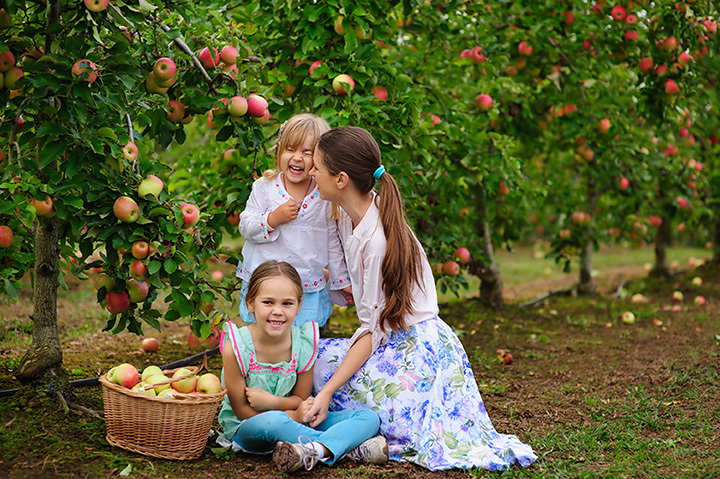 This year, get the family all together and visit the Cider Hill Family Orchard in Kansas City. Apples can be picked from any of the 1,500 apple trees growing on the nearly 40 acres of orchard land. You can also spend time in the pumpkin patch, go fishing on the orchard pond or simple enjoy a picnic. They say you can pick apples from thousands of trees at the Sunflower Orchards near Paola. Good crisp, juicy apple varieties are available to be picked during apple season according to the helpful staff. The entire family can pick these apples, even the smallest members of the family from a variety of trees sized for the very young to the very seasoned apple picker. A young at heart “retired” couple decided to plant a new phase of their lives several years ago. They planted fruit trees and opened the 86th Street Orchard near Topeka. Now the couple host many people every year who prefer to pick their own apples and purchase them in the orchard. Apple pickers can load their baskets with Granny Smith, Fuji, Red & Yellow Delicious, Winesap and Ein Shemer apples. Pick your favorite apple types at the Pome on The Range orchards in Williamsburg. The age-old apple trees produce some of the freshest, good-tasting apples in the area. The staff is helpful and provide a good atmosphere for families to spend time together harvesting apples and exploring the other fruit orchards. At Meadowlark Farms near Rose Hill they are known for picking peaches and pumpkins, but you can pick your own apples, and vegetables in the summertime. They invite individuals or groups to come out and spend a few hours touring and picking fruit. The staff is friendly and knowledgeable about the trees and the fruit, especially the apples. The Wagon Wheel Orchard near Gardner is said to be one of the “world’s most diverse pick-your-own orchards” and offers a full slate of apple varieties anywhere. The orchard’s family history dates back to the 1800s and today’s generation of fruit growers is interested in the “collection, preservation and propagation of endangered apple and pear varieties,” according to their website. The Orchard is a fruit farm with a “store front” near Emporia. They offer fruit and vegetables to pick, or pick up, throughout the growing seasons. Individuals and groups are always welcome to come and explore the orchards, especially the apple trees. The Orchard is usually open between August through January. It is apple picking time at the Vertacnik Orchard in Lawrence. The fresh, crisp, sweet, tasty apples are ripe and ready for harvesting. The “u-pick” Honeycrisp and Gala apples are ripe and ready. The orchard producers say the Red and Golden Delicious apples are not too far behind the ripening “pickable” schedule. Enjoy! At Brenda’s Berries & Orchards in Chetopa, the owner and operator, Brenda, offers several “u-pick” fruit and an in-season variety of apples. The “pick-your-own-apple” season begins around September and often lasts into November. Enjoy the orchard and enjoy the apples, you-pick! The Apple Hutch in Plains is a family owned “pick-your-own” fruit orchard near Plains. For generations, these orchards continue to produce varieties of fruit and especially apples. Check the days and times you can pick and always check with the store staff first before entering the orchard.